Offset n00b here. Played the occasional Jag/JM but never bonded with one before playing the new American Pro series. Now I know these are divisive, but I prefer the simplicity, ergonomics, and tones of these models. 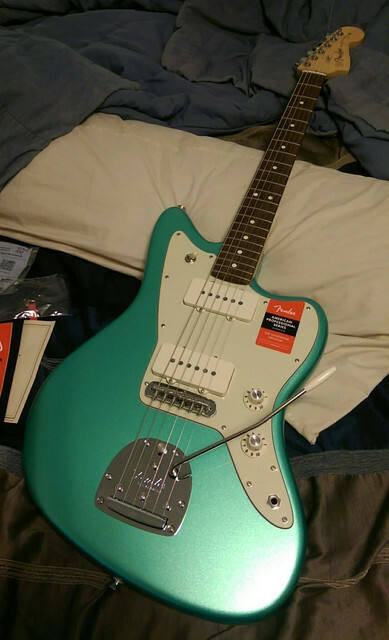 I just couldn't get used to a JM with a maple board, but I loved the mystic seafoam finish. So to the Stratosphere I went, and I couldn't be happier! I'm a big fan of surf tones and my fav band in the genre is Shadowy Men on a Shadowy Planet. They would often be seen live playing Gretsches (I own a few) but I've read that in studio they used JM/Teles for brighter/cutting tone. This JM gets tones I could only approximate with Dynasonic equipped Gretsches, and never get close to with Filtertrons. Wash it with some slapback and some reverb and I'm in heaven. But they make a good rock/blues machine too. Thought I'd share some pictures of this rare bird for those who may be contemplating a similar build. I'll post a couple more later. Good taste, exactly this has been my "next guitar" for months. Dammit now I'll have to wait for them to put up another one. That's really beautiful - congrats! God I love this color. I wish MJT could match it but I don't know what to tell them. Is the paint code for this out in the wild? It’s your first, but will it be your last? Discuss! Just played one of these w/ the maple board this afternoon, the first AmPro JM I've tried, and was pretty darn impressed. Love the chunkier neck and the V-Mod pickups sounded pretty great to me. I've learned to never say never when it comes to me buying guitars. But I will say there are few jazzmasters out there with this feature set. I am curious as to how a set of av65 pickups would sound in this... even though I'm pretty happy with the sound. Sometimes I can't just leave well enough alone. i wish that color was available in the mod shop.